When I made the Som Tum Thai with Salted Crab for this recipe, I only took a bite to check the recipe and gave the rest to my friend (picture on the right). The next morning, I was still haunted by how great it was. So, I decided I had to make it for lunch, so it would stop popping up in my mind. In half an hour, I was sitting and devouring a new batch of Som Tum. It was so good. I love how the heat and the sweet and sour play against one another. 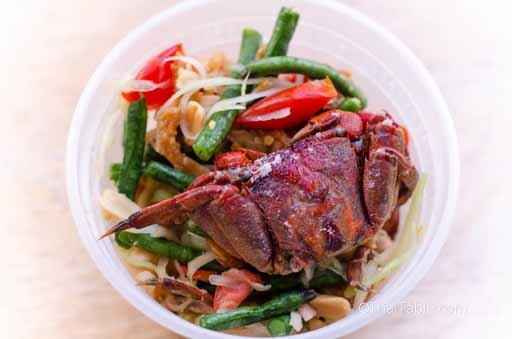 The salted crab added an extra dimension and a distinct flavor to som tum. The crunchiness and the creaminess of roasted peanuts ...It was like war in my mouth. It was hot but I couldn’t stop eating. A bite of warm sticky rice contrasts and calms down the sharp flavors in my mouth. At the same time, I wondered and thanked whoever made this dish for the first time. Did they know how wonderful the flavors have come together? Hopefully, by doing this recipe and having enjoyed som tum, it will stop haunting me. But I know I'll be hearing 'It's baaaack!' soon. Shredded green papaya is sometimes available at Asian markets. If you got some, keep it in the refrigerator until you're ready, so that it stays crunchy. If your dried shrimp is very dry and hard (tough to chew), soak it in warm water before using. 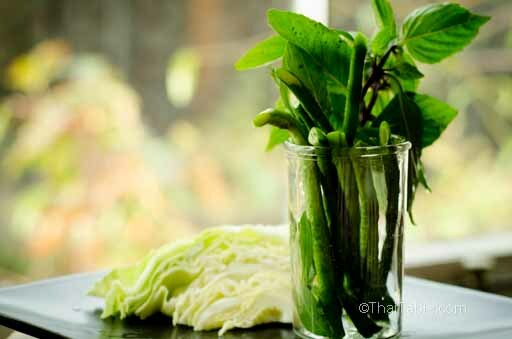 In Thailand, we use Thai yardlong beans, which are light green and bigger than the Chinese yardlong beans. Both are available at Asian markets and farmers markets and you can use either. The Thai yardlong beans are harder to find, though. Green beans are a great substitute. Any small tomatoes such as cherry tomatoes or grape tomatoes will do. However, if you're unable to get small tomatoes, large is a good substitute. Just slice them smaller. 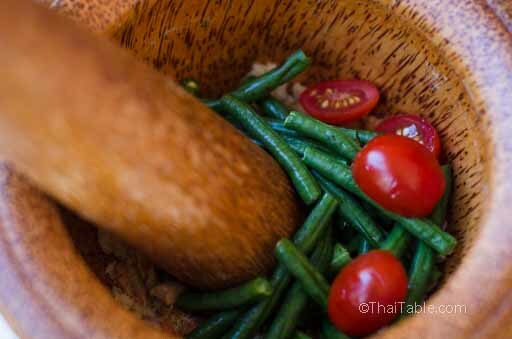 If you don't have the som tum mortar (clay or wooden), tossing som tum like salad will work too. The ingredients might not be as bruised and the flavors will not penetrate the ingredients but your som tum will still taste great. Your finished som tum should look like it has been through a cycle of tumbling. At this point the different flavors should be well mixed and have penetrated into the green papaya. 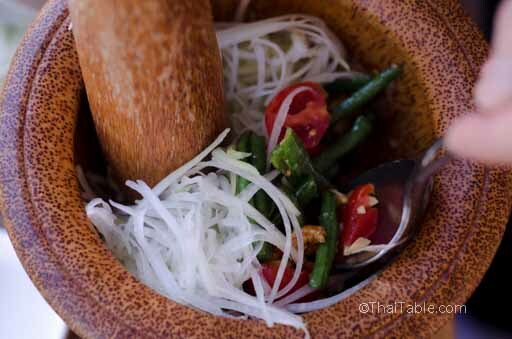 Som Tum is a dish that should be balanced to your own liking. When my mother orders som tum, she asks for 'mai ped' (not spicy-hot) sum tum. Often she'll indicate, 'one pepper only'. For me, I like my som tum, medium spicy and very sour. In this recipe, use the amounts of seasonings (fish sauce, peppers, palm sugar, lime juice) as a guide. You'll know what you like, not too dissimilar to how you have personal taste for your coffee. 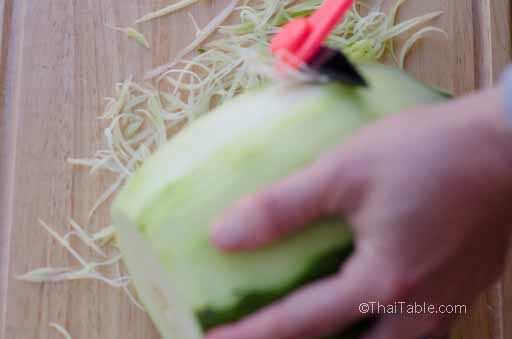 If you have shredded green papaya, skip to the next step. Otherwise, cut the stem out of the papaya and peel only one side. The skin will keep the papaya from slipping out of your hand while you are shredding it. Shred or grate the papaya (picture 2). You can use a papaya shredder or large hole cheese grater. Add the crab to a microwaveable bowl and cover the crab with water. Either use a large bowl or put a plate under it. The water will boil over. Microwave the crab for 5 minutes. You can also boil it in a pot over the stove for 5 minutes, too. 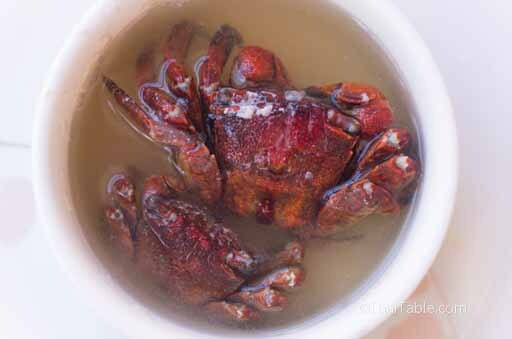 The crab should turn reddish similar to other cooked shellfish (picture 3.) Let the crab sit in hot water until you're ready to add it. Trim each end of the beans and cut them into 1 ½ inch pieces. Halve the tomatoes. Roast peanuts or use roasted peanuts. Roast peanuts by constantly stirring peanuts in a pan for until lightly brown, about 7 minutes, depending on your heat. 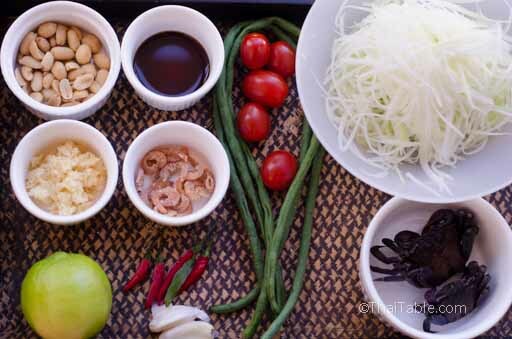 There are several ways you can make or mix som tum. 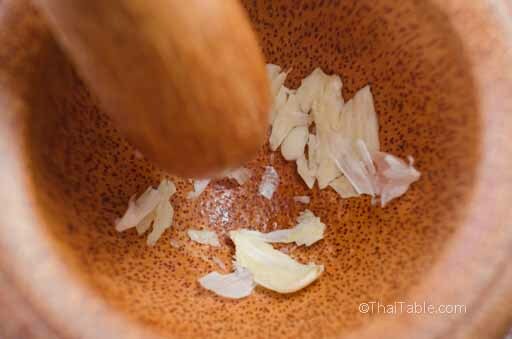 There are 2 methods below, the traditional method that's used in Thailand and a cobbled up method for those without the tools (som tum mortar and pestle). Drop the garlic in and crush it lightly (no need to peel the garlic). The garlic peels will either come out during the crushing or can be left in the som tum (picture 4.) Add palm sugar, dried shrimp, roasted peanuts, and fresh chili peppers to the mortar and crush lightly (picture 5.) For super spicy som tum, crush the chili peppers well. Add the cut tomatoes and beans (picture 6.) Tear crab into pieces and add into the mortar. Crush and mix with a spoon. Add fish sauce and lime juice. Taste your som tum dressing; you may want to add more seasonings. If you are happy with the taste, add the shredded papaya (picture 7). Mix it together with a spoon. Taste again. Crush the garlic with the flat part of the knife and drop it in a bowl. Crush the peanuts in a plastic bag with a meat tenderer/heavy pan and add to the bowl. In the same bag, crush the chili peppers. Alternatively, the peppers can be sliced lengthwise. Crush the salted crab in a plastic bag and add to the bowl. Add the seasonings, palm sugar, fish sauce and lime juice to the bowl. Add the dried shrimp, cut tomatoes and yardlong beans/green beans. Mix it well. Taste the dressing and add any additional seasonings. Add the grated green papaya. Toss well and taste again. Pour into a serving plate and serve with fresh vegetables (picture 8: cabbage, yardlong beans and Thai basil) and sticky rice.